For those of you who visit my site often you know I like to grow unique or odd seeds. I also enjoy growing heirloom seeds. Heirloom seeds are seeds with a rich historical background that have often been saved and passed down from one family generation to another. Many of these seeds were brought over on the Mayflower or when people immigrated to the United States. There are two very important reasons to grow heirloom seeds. One is you can save the seeds from year to year and save money on your gardening costs the following season. I like saving money in the garden. I apply my savings to other seeds or plants for the yard. 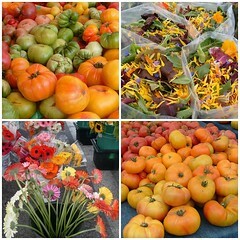 The second reason and most important in my opinion is that heirloom seeds produce vegetables with a richer taste. A friend of mine recently said, “vegetables like Grandpa used to grow.” I feel heirlooms grow better, are stronger plants and seem to ward of insect problems. One of the other seeds that you often find in garden centers is hybrid seed. These are seeds that have been chemically and structurally altered to produce a more consistent size or color vegetable or flower. 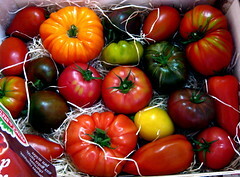 For example many of the newer tomato seeds are hybrids and have been altered to produce a firmer tomato so they will ship better. Yes they ship better but they lack the taste and have a tough outer skin. Another problem with hybrid seeds is that they do not germinate well or produce crops true to the original seed when you save seed from the crop. So if you save seeds for the following year from a hybrid crop you will have no produce or very poor vegetables. By not being able to save seeds from vegetables, varieties may die out. Great tasting or producing varieties are becoming lost, and seeds will only go up in cost. So save your seeds from your favorite heirloom variety. It’s easy and can be a fun project, particularly for children. You can also ask your friends and neighbors to share and trade seeds, You will be saving money and helping to preserve great seeds, crops and history. Its also a form or organic gardening, which benefits us all.